Ok – does that mean I can be anything I think that I can become? Context holds supreme value. If I think I am a unicorn…crickets. However, if I think I am I writer, I can be one. In fact, I am a writer as demonstrated by writing this very blog. Now, if I intend on being a successful writer…well, that takes a bit more time, effort, skill, and product. This is important: Thought requires action as a follow-through. Henry Ford is noted for saying: “Whether you believe you can do a thing or not, you are right” (Quote Investigator). Excellent, but how do you apply the concept? As with many things, sheer belief is not enough. Belief in the self requires more than simply thinking, and one must act on their desires for effect in the material world. What that means is that one must apply their thoughts actively in their lives. In example, Steve believes he will become a brain surgeon. Steve knows he needs education and experience so that he may become a doctor. Steve toils away, challenging himself at university so that he has realistic tools that provide validation for his belief. Steve becomes a doctor because he believed in himself – but the only way he could make it happen was through action. That initial belief in the self is a crucial element, but belief is not strong enough on its own and cannot produce results. Way back in Communications and Public Speaking, I learned about “self-fulfilling prophecies.” What one tells the self holds much authority with what that individual holds as true and/or possible. Consciousness is shifty like that, the more often we hear or say something is true, the more true it becomes. “You predict something and then knowingly/unknowingly act to cause the prediction [to] come true” (KAAGMANDU). In application, the concept works at improving or destroying one’s self-conscious opinion of what they can or cannot attain in life. This can be seen clearly in abuse. Imagine Molly has an abusive boyfriend who tells her everyday that she is unattractive, overweight, and stupid. Because Molly value’s her boyfriend’s opinion of her and trusts his judgement, she will eventually believe the negative comments are true and real. Molly’s judgment is clouded by outside prophetic limitations. However, if she considered the statements with a positive manner, she could see that the boyfriend defeats himself with his claims. Molly cannot be completely unattractive or else she would not have attracted the boyfriend. Instead, the negatives listed are probably fears the boyfriend has in regards of himself. Abusive boyfriends often project their flaws on their victims. What Molly needs is a better self-image – and that goes back to what one thinks they can be. Molly can accept she is not a supermodel, and focus on her true qualities, hence altering her perception of herself. “The greatest discovery of my generation is that a human being can alter his life by altering his attitudes” (William James). 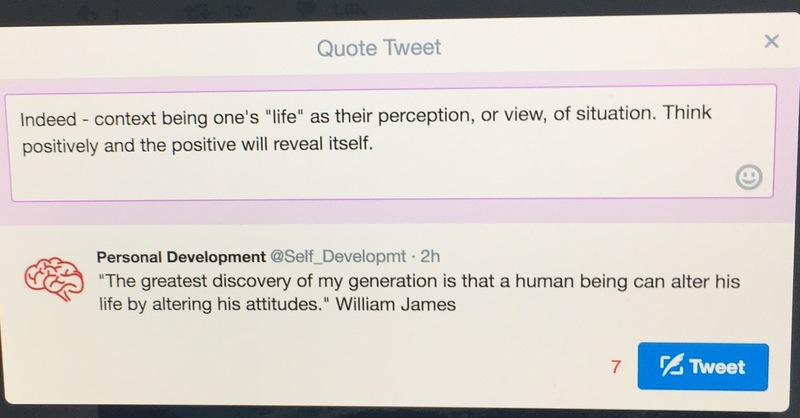 William James’ quote caught my eye this morning on Twitter.Great quote, with excellent intentions. However, I wonder if people unfamiliar with James’ variant philosophies catch the meaning. And, I consider the dangers lurking in the Law of Attraction when taken out of context. “Now the starting point is to see that Thought, or purely mental action, is the only possible source from which the existing creation could ever have come into manifestation at all…” (Thomas Troward). I cannot accept concepts of the Law of Attraction. I’ve tried; I’ve read, researched, theorized, and exhausted myself searching for firm ground. I decided not to include a link because I cannot feel good about any of the sites I’ve studied. The main issue I hold is that struggle is necessary for growth, just wishing for something does not make it so. I do recommend The Dore Lectures by Thomas Troward, but I caution that his look at Mental Science relies heavily on religious belief. Click HERE and read free online. Now, that’s not to say that there is no value in the theory of like attracting like – the fundamental holds true for implementing positive perception in life. However, perception must at one point come to terms with reality. Ayn Rand said, “In order to live, man must act; in order to act, he must make choices; in order to make choices, he must define a code of values; in order to define a code of values, he must know what he is and where he is—i.e., he must know his own nature (including his means of knowledge) and the nature of the universe in which he acts—i.e., he needs metaphysics, epistemology, ethics, which means: philosophy. He cannot escape from this need; his only alternative is whether the philosophy guiding him is to be chosen by his mind or by chance” (Objectivism for Intellectuals). And so…we must take a closer look at Metaphysics. What exists and what does not show face in reality. A deeper interest in reality has led me towards Objectivism. Ayn Rand developed Objectivism Philosophy and wrote novels that revealed societal issues, including The Fountainhead and Atlas Shrugged. Currently, I am about one-third through the latter, and I see numerous elements of corruption present in contemporary society as described by Rand in 1957. The Ayn Rand Institute carries values of her philosophy and offers further study. Check out ARI and learn about Objectivism. Share your comments below. I watched Prof. Peikoff’s lecture yesterday, and I really like the sound structure of Metaphysics, Epistemology, Ethics, Politics, and Aesthetics as seen in Objectivism. Of intense interest is how to implement laissez-faire Capitalism – it sounds scary, but I think that’s false-morality talking. Definitely deserves a . Altering one’s reality begins with altering the self, or how one perceives the self to be. Starting out basic, let’s set a sound, realistic version of who that self is, what that self can do, and how that self behaves. Think on it; really work it around in your mind. Then, realize that for the self to improve, that self must act on its desires, goals, and wants. Altering the self begins in the mind and continues through implemented action.